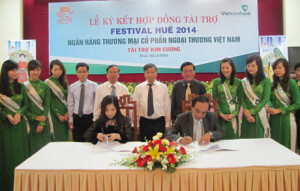 A Tourism and Festival Information Center has been inaugurated in the ancient capital of Hue in Thua Thien-Hue Province by the Hue Festival Management Board. The Tourism and Festival Information Center will provide all visitors with data on the Hue Festival, tours, cultural and art activities in Hue City, offer publications, documents, and also maps on Hue. The Center will promote Hue as an attractive, friendly and safe tourist destination, inform on activities of travel agencies, tourism businesses, and also receive feedback from and support tourists in case of an emergency. The Center will operate from 8am to 9pm every day, including holidays. Nguyen Van Thanh, Vice Director of the Hue Festival Center, said that Thua Thien-Hue Province wants to highlight the special and diversified cultural values and natural landscapes of the area, which were all recognized by UNESCO as tangible and intangible cultural heritages. In addition, Hue Festival has already become an international cultural event attracting a large number of local and foreign visitors. The numbers of tourists to Hue have constantly increased. The city received 2.12 million holiday makers in the first ten months of this year, including 784,000 international travelers. The 3rd special tourism promotional program called ‘Golden Tourism Week’ will be organized in Hue from December 24-30, announced the Hue Monuments Conservation Center. Hanoi’s Department of Culture, Sports and Tourism is developing tours to six selected trade villages in the city as part of efforts to promote this type of tourism in the capital. Destinations include Van Phuc silk, Bat Trang pottery, Phu Vinh rattan and bamboo, Son Dong fine art sculpture, Du Du sculpture, Quat Dong embroidery and Ngo Ha mother-of-pearl inlay villages. The department also acted as a bridge to connect travel agencies and trade villages to promote tourism products. The city is planning to develop this type of tourism in 14 other traditional trade villages. With 1,350 trade villages, including 207 recognised ones, they create much potential for tourism in Hanoi. Among those, only Bat Trang pottery and Van Phuc silk villages are capable of attracting visitors. However, the number of tourists travelling to these sites is declining due to several internal factors. Van Phuc silk village in the city’s Ha Dong ward used to have 1,000 silk weaving looms. However, only 250 still operate, with 400 households involved due to the impacts of urbanisation. Nguyen Van Thuy, Chairman of Van Phuc ward People’s Committee, said if the negative impacts are not prevented, the silk business may disappear. According to statistics from Gia Lam district’s Bat Trang commune People’s Committee, the Bat Trang pottery village welcomes about 60,000 visitors both from home and abroad who come to buy pottery products, bringing in over 200 billion VND (9.52 million USD) a year. However, the tourists have not had a chance to experience the village’s cultural and historical values and participate in making pottery products. This is the common situation in other trade villages in Hanoi due to the lack of synchronous coordination among tourism managers, travel agents and local authorities. In a bid to increase tourism between Viet Nam’s central region and cities of Korea, the Korea Tourism Organisation (KTO) in Viet Nam was sponsoring a roadshow. During the event, KTO also presented Korea Travel Awards to local travel agencies. Da Nang and world heritage sites in the central region have been favourite destinations for Korean tourists in recent years, with fresh seafood and pristine beaches. Over 55,000 Korean tourists visited Da Nang in the year 2013, an 82 per cent increase over the same period last year. There are 12 flights from Korea to Da Nang every week, carrying an average of 1,500 passengers travelling between Da Nang and Korea. The central coastal city hosted over 2.7 million tourists in 2013, said officials.